Lucky Charms. Cocoa Pebbles. Count Chocula. Kix. Rice Krispies. Chex. Banana Nut Crunch. Honey Bunches of Oats. Frosted Mini Wheats. These, my friends, were my favorite cereals growing up…and some well into my 20s. In fact, my college roommate and best friend Roshni and I would buy a gallon of milk and multiple boxes of Honey Bunches of Oats every week. We would then sit in our dining room after class and go to town. It was quite the sight! That habit continued well into post-college life. When I was too lazy to make dinner, cereal was my go to meal. I’m pretty sure I could still do quite a bit of damage with a box of Banana Nut Crunch. Looking back, I may have been a tad bit obsessed. There’s nothing like marriage to help change your habits. While Vishnu loves his Cinnamon Toast Crunch, I honestly can’t imagine him eating a bowl of cereal for dinner. I don’t even remember the last time I bought a box of cereal. What you can find us munching on throughout the day is homemade granola. Yes, we traded in cereal for granola! Granola is cereal’s sophisticated older sibling. It’s an essential ingredient in parfaits. It’s delicious sprinkled on top of smoothies. And a bowl full of it plus a little almond milk still hits the spot! My homemade granola is easy to make and tastes insanely delicious. 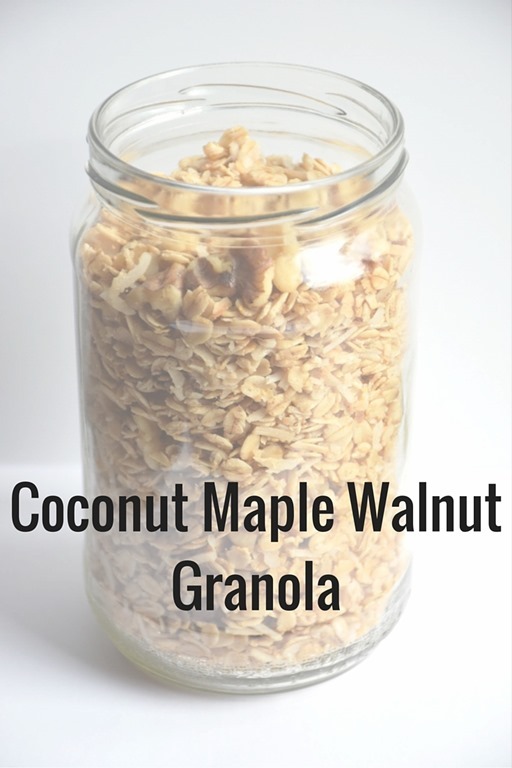 The toasted oats, walnuts and coconut shreds add a nice crunch while the maple syrup brings the perfect amount of sweetness. The coconut oil, cinnamon, and pure vanilla extract bring a punch of their own. It’s the perfect combination of ingredients. PERFECT! I could eat this stuff all the live long day. In fact, at about 4:00 pm every day, I find myself zeroing in on the container of granola that sits in plain view in the far corner of our kitchen. I can’t pass it up! Especially mixed together with plain yogurt and a spoonful of peanut butter. Just trust me on this! 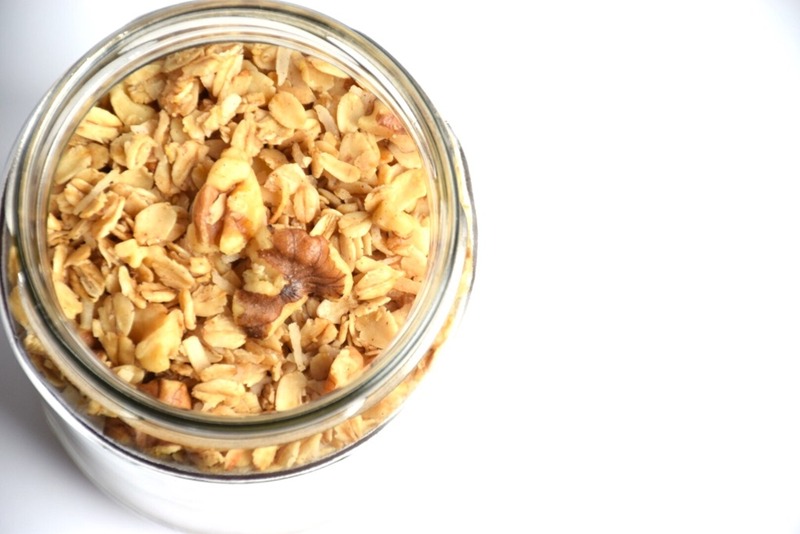 If you’re looking for a healthy, wholesome snack to keep around the house, this coconut maple walnut granola is for you! Combine the oats, salt, walnuts, shredded coconut, and cinnamon in a large bowl. Set aside. In a small bowl, combine the vanilla extract, coconut oil, and maple syrup. Pour the wet ingredients into the dry ingredients and mix until incorporated. Evenly spread the granola mixture on a large baking sheet. Bake for 22 minutes, stirring once at the halfway point. What was your favorite cereal growing up? And now? I’m loving this combo right now!! Coconut + Maple = Party in my mouth!